Happy October to all! Whatever your race, creed or color, whatever your gender, age or orientation, whatever your nation, neighborhood or internet access point--your voice is welcome here. Some while ago I was led to this post by Aarti Chapati, a Chicago reader who blogs at BookLust. She has been hosting #Diversiverse for 3 years now, inviting bloggers to review books that contribute to the diversity of our shared body of literature. She specializes in science fiction/fantasy but the event is for all genres. I signed up right away and although I'm a couple of days ahead of her scheduled diversityfest, I wanted to take this hosting opportunity to highlight some of the good work that is being done to make children's literature diverse enough to allow every child to find a mirror between the covers of a book. This link will take you to Aarti's compilation of all #diversiverse book reviews from previous years. At the bottom you'll find the spot to add your links. Meanwhile, today is a regular school day for me, so this is going to be a self-rounding round-up and as usual, I won't get around to visiting everyone's post until the weekend. Thanks for stopping by My Juicy Little Diversiverse this week! I went looking for a book by an author of color to review, and found my way to this rather comprehensive and thought-provoking post by Betsy Bird of Fuse#8 Productions at SLJ. I've read the Nurture Shock book too, and one of the reasons I like teaching the youngest children is because of an opportunity to make an impact on their "inclusion" stance before their ideas of "us" and "them" are permanently established. Our school system had last Wednesday off for Yom Kippur, but when my student Aini was absent on Thursday I remembered Eid Ul-Adha. I taught Aini, who is Indonesian, in kindergarten so I know her family is Muslim. During Morning Meeting on Friday she shared about going to a "big place like a soccer field to pray, boys in the front, girls in the back." I made a big point about how much Aini knows that many of us have never heard of and explained why. Next it was Didi's turn to share. He is a boy of few words and often passes up his turn to talk, but on this day he told us that his father went to pray too, at the mosque. Well! In a class of only 14, I have more Muslim than Jewish kids--that's a first for me at this school. So when I went to choose a new-to-me book for my #diversiverse review, I selected Big Red Lollipop by Pakistani-born Canadian Rukhsana Khan (Viking Penguin, 2010). This picture book for ages 4 and up is not primarily written to support conversations about race, religion or ethnicity (see my recent thoughts on stories that teach lessons). In fact, it's an autobiographical story much more like A Birthday for Frances, about two siblings, a party and frustration, greed and jealousy--emotions that are just plain human. However, these siblings, in their "regular" kid clothes, live in a "regular" house with their immigrant mother Ami, who wears a headscarf and asks, "What's a birthday party?" (She also feeds the baby and works on her computer in the course of the book.) Ami gives her oldest daughter Rubina permission to attend the party as long as little sister Sana goes too, and of course Sana not only behaves embarrassingly at the party but eats Rubina's goodie-bag treat as well as her own--and then Rubina gets scolded for being greedy. Oh, the unfairness! "A really long time" passes and Sana is old enough to be invited to her first birthday party. By now, the baby is old enough to demand to go to the party too--and Ami is set to make Sana take her, just as Rubina had to take Sana. It's only fair. But then Rubina intervenes, and the red lollipop of anger becomes a green lollipop of understanding between the sisters. The first-person text is lively, full of authentic-sounding dialogue. It skims right over that question about birthday parties ("It's when they celebrate the day they were born." "Why do they do that?" "They just do! Can I go? "), but a teacher or parent could slow down and help children investigate the information in both illustrations and text to get at the diversity agenda's best general question: the Identity Question. Who are these characters? What do we recognize as familiar and what do we notice as unfamiliar? What might those unfamiliarities make us think about the characters? What other information might each of us need to understand their words and actions? These questions can apply to characters in any story, even (especially?) those in a culturally "normative" literary work. That's the practice we want to develop as leader-readers--the practice of regularly investigating identity--all identities--rather than assuming that we know all there is to know at first glance. 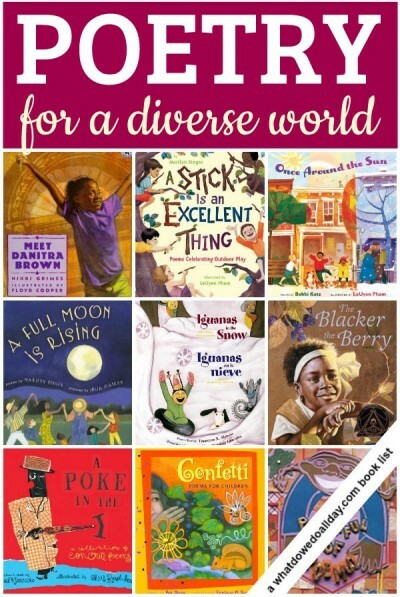 Perhaps you know the We Need Diverse Books campaign, which took off in April 2014 "in response to the announcement of an all-white, all-male panel of children’s book authors at a major book and publishing convention. What began as a social media awareness campaign quickly grew into a global movement that demanded the attention of the publishing industry, the media, and readers everywhere." I heard about it, of course, but it was later, by accident, that I learned it all started with my fellow soccer mom, Ellen Oh. Our daughters play on the same school team, and as our closest neighbors there's a lot of shared driving. (The girls are often together, but the moms hardly ever are, which is how I failed to connect WNDB to Daisy's ride home.) I am filled with admiration for the energy which kicked off this powerful campaign. And thanks for hosting! Love the idea of a diversiverse! My sun and moon poems are opposites, so I guess they're somewhat diverse. But not very tolerant. Happy Poetry Friday! Greetings, Heidi! Thank you so very much for hosting this week's PF. Thank you, too, for allowing us "early birds" to post. Listening to the news in the background as I am doing this linking, I am feeling so very sad! More violence. So heartbreaking! ...Proves that what you posted about is so needed: appreciation for diversity; tolerance. No more violence! ... My PF offering is an "Old" poem in celebration of the International Day of Older People, held Oct. 1st each year. My prayer is that all of us--especially our beloved children--can grow old peacefully and gracefully. God bless the grieving families. Love the idea of a diversiverse! Hi Heidi! Thanks for link to the #Diversiverse--I'll be going down the list of titles to see what my library may be missing. Like Robyn, I have a few photos, see them at Random Noodling. And at Kurious Kitty I have an delightful little video (that I found on Facebook) and a classic poem. Hi, Heidi. Great post (I love the stories from your classroom). I'm going to go back and read Betsy Bird's post. I just read a great YA horror novel SHALLOW GRAVES. It made me think about why we read horror (it's a metaphor for real life). Dorothea Lasky's wonderful poem "Monsters" makes a perfect pairing for this book. Love hearing about the #diversiverse, Heidi. I try to read as many diverse books as I can, so thanks for the list, and for your stories. I'm still celebrating the eclipse/supermoon, especially wonderful because it's YOUR Poetry Friday. This time it's with a poem by Billy Collins. Thanks for hosting. Thanks for hosting the Poetry Friday classroom this week, Heidi, and welcoming us all with open arms. At Today's Little Ditty, it's a new month and a new DMC challenge! I'm spotlighting Marcus Ewert and MUMMY CAT. A couple of new books I'll have to check out now - thanks for sharing, Heidi (and for hosting)! Heidi, this summer I attended Janet Wong's and Sylvia Vardell's ILA15 session about diversity in literature. They alongwide with a few authors spoke about identity and voice. I find that secondary students shy away from books that they cannot identify with. Having books by authors from diverse backgrounds affords students the ability to read and connect with characters who might be more like them. Thank you for bringing home the message and the term diversiverse. Your review of a picture book for youngsters was interesting because all children from little ones up need to have an attitude of caring about others in a diverse world while understanding that their are basic commonalities among children. I am discussing the upcoming Random Acts of Poetry Day with some original poems for my new Finding Fall Gallery: Autumn's Palette. Dear Heidi, Thank you for hosting and for keeping us honest. I feel as CB does this evening. Oy--no more--please no more. On your topic, my brain changed as I read Allie Jane Bruce's article in the Fall 2015 issue of Children and Libraries. It's called On Being White ~ A Raw, Honest Conversation. Thank goodness for poetry today. All I have is this day. At TeachingAuthors we are each writing on Making a Living as a Writer. I have 3 handy-dandy tips on this topic...and a funny story about making money as a poet, as well as the poem in question. Thanks for hosting Poetry Friday Heidi and for sharing news about Diversiverse. I'll be watching out for Big Red Lollipop. Thank-you for hosting this week's Poetry Friday, Heidi, and sharing insights into your classroom. Not feeling too great this morning, as we have been passing around a cold at our house this week :-( I'm glad it's (Poetry) Friday. Thanks for hosting! Your students are fortunate. And so will be others, as we apply what we've gleaned here. Appreciations for the titles & article links. I look forward to reading Betsy Bird's piece & the others. Also, you draw invigorating comments with juicy links. Great weekend to you & your family, Heidi. Thanks for hosting in the midst of your busy schedule. I, too, enjoy teaching young students and having conversations about inclusion and tolerance. What happens in middle school and beyond? Because my young kids get it. I didn't know about this book before. Thanks for sharing and pointing me toward diversiverse. The diversiverse is here to stay---and I'm glad it has champions like you. I'm in with the etheree form, with my Poetry Sisters year-long poetry project. Thanks for sharing your classroom and for hosting today. There is something so powerful about books presented bilingually -- two worlds of words to explore and delight in! The girl in the video chewing her hair makes me smile. :) Thank you! 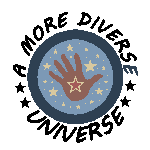 Here's to a more diverse universe! I'm Etheree-ing today with the Poetry Seven Sisters. Thanks for hosting. We are always looking for more diverse books at our house. I can't wait to check out the diversiverse. Thanks for sharing this on your blog and for hosting the party. Thanks for hosting and for this interesting post, Heidi! Francisco's poem is an inspiration to me! Thank you for this peek into the diversiverse! "Alarcon is here to tap into the dreamer of these children..."
"Each language I believe is a universe...a window to the universe." "I believe that poetry is about empowerment." The advice for young writers? There's no advice!" Thanks so much for this post! I am getting ready to teach this morning, but am planning on coming back this afternoon to read it more closely and follow your links. So exciting! My selection is Hallowilloween: nefarious silliness" -- written and illustrated by Calef Brown. Thanks so much for sharing this book. It sounds like a gem. I'm in today with my poetry sisters and a couple of etherees. Whew! With 8 mins. left to midnight, realized I hadn't linked properly this morning. Hope it's not too late to be part of Poetry Friday. (Am glad there are 3 hrs. left on the West Coast). ...Sorry! What a rich and informative post! I love the video, and Francisco X. Alarcon's advice to touch/smell and taste/every word. Thank you for hosting Poetry Friday!